Low drone on G throughout, for example open G string on violin, viola, cello. If wind instruments play the drone (for example clarinets, saxophones) they should consider playing 'off-stage' or in an adjacent room. The drone may start before the piano, but from rehearsal letter A the drone should very gradually fade out to silence by the last bar. Up to 12 bowls played by 2 players. The bowls (domestic ceramic, porcelain, glass, stainless steel etc.) can have random 'pitch' but all should sound as resonant as possible. The bowls are placed on a large square white tablecloth or sheet on the closed piano lid, and played gently with chopsticks or similar. Ideally, there should be at least some white and blue bowls in the collection and some that appear 'old'. Each player plays in time with the piano, may choose which bowls to strike ad lib., but play a repeated semibreve rhythm throughout. The bowls may be widely spaced on the piano so that the players have to reach for them. (But not so far as to be uncomfortable, or where there is any risk of accidental breakages). The bowl players may finish up to 40 seconds after the piano stops playing. The title '2 Ping' refers to the sound of the piano, or to the sound of domestic bowls being struck. Porcelain bowls are sometimes struck gently with a finger nail to gauge their quality - a 'ping test'. 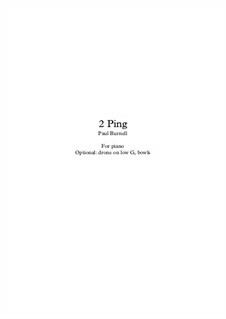 The title also refers obliquely to Samuel Beckett's 1967 short story 'Ping'.